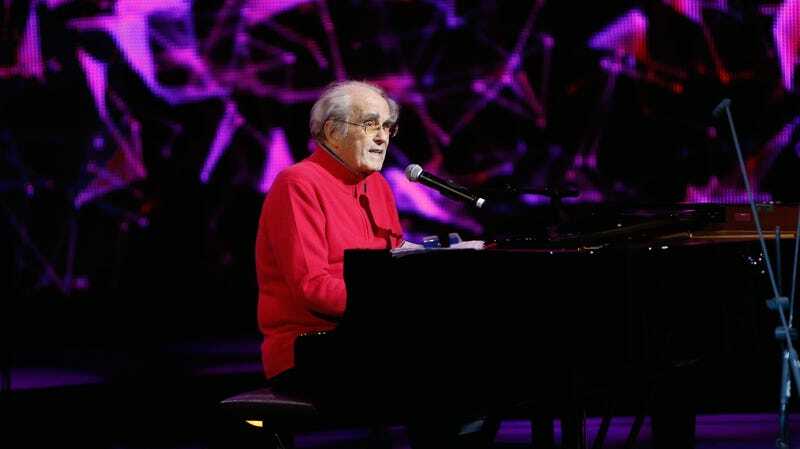 Musician, conductor, and incredibly prolific film composer Michel Legrand—whose numerous credits include scores for everyone from Orson Welles to the Smurfs—has died. A three-time Oscar winner, Legrand’s jazzy, melancholy music powered some of the most beloved films of the French New Wave movement, most notably with his celebrated score for Jacques Demy’s The Umbrellas Of Cherbourg. Born into a family of conductors in Paris in 1932, Legrand grew up in the world of music, studying from the age of 11 under fabled piano and composition teacher Nadia Boulanger. Already a well-established jazz pianist and conductor, Legrand composed his first film score in 1957, writing music for Jacques Pinoteau’s comedy The Tricyclist. Blending his jazz influences with big, emotional musical swings, Legrand quickly became a favorite of French directors, most notably Demy, who used him in films like 1961's Lola, 1967's The Young Girls Of Rochefort, and—in a career defining role—1964's Cherbourg, in which every line of dialogue is sung, rather than spoken. Infatuated with Legrand’s romantic, stylish, technically brilliant work on Cherbourg, Hollywood swiftly lured him across the Atlantic; he wrote the score for Robert Ellis Miller’s Sweet November in 1968, and followed it up with an Oscar win for his music in The Thomas Crown Affair that same year. (Specifically, winning Best Song for “The Windmills In Your Mind.”) Legrand would ultimately be nominated for the Oscars 11 times throughout his 60+ year career, winning for “Windmills,” Summer Of ’42 (in 1971), and Yentl (in 1983). This, in addition to the occasional dabbling in television—his soundtrack for the football and cancer TV movie Brian’s Song charted for eight weeks in the States in 1972—and the fact that he also maintained what were, essentially, two other full careers, continuing to record as a jazz musician and conduct various orchestras around the world. Legrand composed more than 150 film scores over the course of his career, which spanned both continents and musical styles. His work appeared as recently as last year, when he composed a score for the restoration of Orson Welles’ The Other Side Of The Wind. (He’d previously contributed the mischevous, spritely compositions for Welles’ 1974 “documentary” F For Fake.) Legrand died in his Paris home yesterday; he was 86. What&apos;s your favorite opening credits sequence in a film?